this extremely small but powerful technique can best be compared as feature flags for loggers. The created debug logger is disabled by default but can be enabled without changing a line of code, using flags. Separated development and production builds to minimize impact on your application when bundled. Allows for customization of logger, messages, and much more. namespace Required This is the namespace of your logger so we know if we need to enable your logger when a debug flag is used. Generally you use the name of your library or application as first root namespace. For example if you're building a parser in a library (example) you would set namespace example:parser. force Force the logger to be enabled. colors Colors are enabled by default for the logs, but you can set this option to false to disable it. Unlike console.log statements that add and remove during your development lifecycle you create meaningful log statements that will give you insight in the library or application that you're developing. Please note that the returned logger is fully configured out of the box, you do not need to set any of the adapters/modifiers your self, they are there for when you want more advanced control over the process. But if you want to learn more about that, read the next section. There are 2 specific usage patterns for diagnostic, library developers who implement it as part of their modules and applications developers who either use it in their application or are searching for ways to consume the messages. 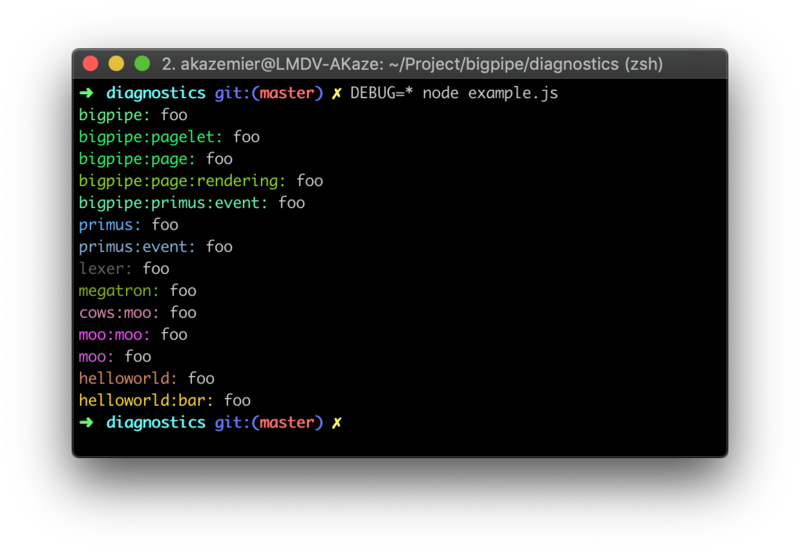 // Force all `diagnostic` loggers to be enabled. // We're running a development build, so output. When you require the diagnostics module you will be given a logger that is optimized for development so it can provide the best developer experience possible. The development logger does not have any adapter, modifier and logger enabled by default. This ensures that your log messages never accidentally show up in production. However this does not mean that it's not possible to get debug messages in production. You can force the debugger to be enabled, and supply a custom logger. When you are running your app using Node.js you should the NODE_ENV environment variable to production to ensure that you libraries that you import are optimized for production. Property on the meta/options object. This is the namespace that you originally provided to the function. There are different builds available of diagnostics, when you create a production build of your application using NODE_ENV=production you will be given an optimized, smaller build of diagnostics to reduce your bundle size. The dev and prod booleans on the returned logger indicate if you have a production or development version of the logger. meta An object with all the options that was provided to the original logger that wants to write the log message as well as properties of the debugger such as prod, dev, namespace, enabled. See API for all exposed properties. args An array of the log messages that needs to be written. Method on the meta/options object. message, Array, the log message. options, Object, the options that were passed into the logger when it was initially created. See modifiers for more information. Adds a new adapter to all diagnostic instances. The passed argument should be a function returns a boolean that indicates if the passed in namespace is allowed to write log messages. See adapters for more information. To be as flexible as possible when it comes to transforming messages we've come up with the concept of modifiers which can enhance the debug messages. This allows you to introduce functionality or details that you find important for debug messages, and doesn't require us to add additional bloat to the diagnostic core. For console based output the namespace-ansi is used. The adapter function should be passed a function as argument, this function will receive the namespace of a logger as argument and it should return a boolean that indicates if that logger should be enabled or not. This adapter is enabled for node.js. This adapter is enabled for browsers. It triggers on both the debug= and diagnostics= names. This adapter uses the localStorage of the browser to store the debug flags. You can set the debug flag your self in your application code, but you can also open browser WebInspector and enable it through the console. This adapter is enabled for react-native. This adapter uses the AsyncStorage API that is exposed by the react-native library to store and read the debug or diagnostics storage items. Unlike other adapters, this is the only adapter that is async so that means that we're not able to instantly determine if a created logger should be enabled or disabled. So when a logger is created in react-native we initially assume it's disabled, any message that send during period will be queued internally. Once we've received the data from the AsyncStorage API we will determine if the logger should be enabled, flush the queued messages if needed and set all enabled properties accordingly on the returned logger. By default it will log all messages to console.log in when the logger is enabled using the debug flag that is set using one of the adapters.